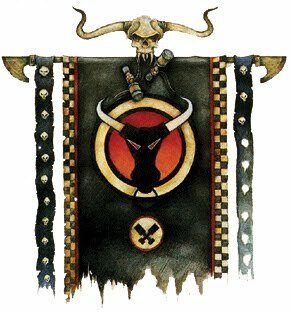 Stormboyz and 'Ard Boys are often ignored because of their price, but both of them provide something the Ork army would find useful. Namely, 'Ard Boyz can shrug off bolter shock and flamers that would decimate the ranks of normal Boyz, and they're more survivable in close combat as well (getting their armor saves on 4 and 5 as well as 6, unlike normal boyz who get theirs only on a 6). Meanwhile Stormboyz are one of the most mobile units in the game, able to move d6" more than normal jump troops. This is also a curse of course, as they lose a model on a roll of 1 when that extra movement is made, but an Ork army almost always has something risky going for it. The general strategy behind this list is very straightforward-- the Boyz mount in battlewagons and ride into the enemy, or to set up defensive positions against reserves. Unless the enemy is doing all-reserves, deep striking those stormboyz is generally a bad idea, but they move faster than normal jump troops so that's not as bad as it sounds. The Stormboyz should easily be able to keep up with the battlewagons (12+d6+d6 movement when running, 12+d6+6 movement when assaulting), and provide a sizeable melee threat range. More than that, they're also fluffy for a Goffs army anyway-- Stormboyz favor discipline and getting into the fight before everyone else to show that they're more disciplined. A pity the statlines don't show this discipline very well, but then that's stats for you. This fits in to a Goffs theme because Goffs more than any other Orks tend towards a no-nonsense approach to warfare. Similarly, they produce a lot of Scarboyz and 'Ard Boyz, who are veterans that aren't quite up to Nob level. My original list had a pair of Nob squads in it (both counting as troops) along with four fully sized Boyz squads, but I just... got bored looking at it while balancing the points costs. Nobs are boring boring to me-- sure, they hit hard, but I just can't get excited about them. So I changed it up a bit. And there's the third of these lists. Talk about it, how you think you can improve its competitiveness, or have it stick to the theme better-- or both, if you're able! Remember, this is not a purely competitive build, it's a thematic build that is also somewhat competitive. It can always use improvements, and with how the Ork codex works it can easily be tailored to suit your taste. There may be a thread in the Lounge shortly that will provide for more serious discussion which the blog comment system cannot provide.